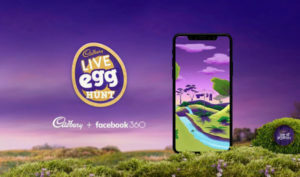 Cadbury, in partnership with creative agency Ogilvy Melbourne, has launched a first of its kind social experience for Facebook Live, bringing the joy of a Cadbury Easter to all Australians. ‘The Cadbury Live Egg Hunt’, a live 360 Facebook video, was created with Alt.vfx, Sydney. Designed to let anyone experience the excitement of a real Easter egg hunt from anywhere in Australia, it saw more than 220,000 hunters around the nation take part during the hour-long broadcast. During the one hour live post on Thursday 15 March 7-8pm AEST, hunters searched the animated world looking for Cadbury Easter eggs. The first person to spot an egg and comment was rewarded with real Cadbury chocolates for Easter, attracting over 70,000 comments. Kjetil Undhjem, Mondelez International’s director of marketing for chocolate said it was really special to be able to bring the joy of the Easter egg hunt to Australian families in such an innovative new way. One Response to "Cadbury Launches ‘The Cadbury Live Egg Hunt’ Social Experience via Ogilvy Melbourne"